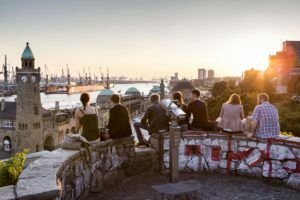 The Free and Hanseatic City of Hamburg lies in the North German plain on the lower reaches of the Elbe, around 100 kilometres from the river’s estuary on the North Sea. With 1.8 million inhabitants on an area covering 755.3 square kilometres, Hamburg is Germany’s second-largest city after Berlin. The city state of Hamburg is one of the 16 federal states of the Federal Republic of Germany. The port of Hamburg is also a major global hub for the industry, logistics and other services with roughly 138 million tons of goods passing through every year. The name Hamburg comes from the first permanent building on the site, which was a castle named Hammaburg. After being destroyed and occupied several times, the city of Hamburg was granted the status of imperial free city in 1189. For centuries, trade and shipping have ensured a cosmopolitan climate in this city on the water. 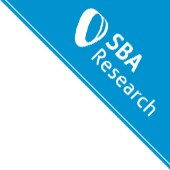 More than 35,000 trading companies with over 125,000 employees make Hamburg the leading foreign trade centre in Germany. More than 500 Chinese companies are located in Hamburg, making it China’s leading European base. The city has the world’s second-largest concentration of consulates, with almost 100 consulates, coming second after New York. Hamburg cultivates these manifold links with other international cities and towns through various networks and partnership programmes. First, Hamburg’s twin cities contribute to a lively exchange. Its first twin city was St Petersburg in 1957, with Marseille following in 1958. Shanghai, Osaka and León twinned with Hamburg between 1986 and 1989, Prague in 1990 and Chicago in 1994. The most recent city partnership is with Dar es Salaam, also sealed in 1994. 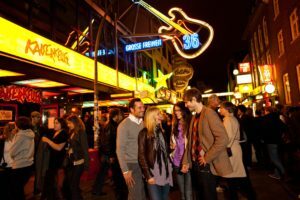 Reeperbahn is the main street for amusement as well as the red light district, located in the urban quarter St. Pauli. Approximately 930 meters long, with lots of bars, clubs and night clubs, it received the nickname “sündigste Meile der Welt”, meaning the most sinful mile of the world. The concerthall of Hamburg, completed in 2016, was built with the intention to create a new landmark for the city. 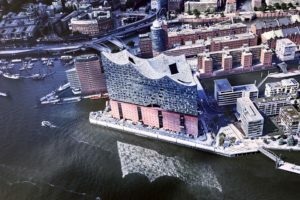 The building, also nicknamed “Elphi”, is 110 meters high and is located on the right bank of the river Elbe. The glas front mimics a sail, water waves or a quartz crystal. 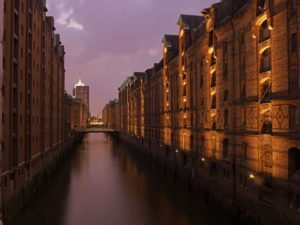 The Speicherstadt, located in the port of Hamburg is the worlds largest, historical storehouse complex and is part of the UNESCO World Heritage Site. Built between 1883 and 1927 on top of Elb islands and former housing quarters, the site is located south of Hamburgs’ old town and spans across 26 hectare of the former islands. Not too cold during winter and warm, sometimes hot, days during summer are interrupted by the famous and so called „Schmuddelwetter“ with rain showers from time to time. The maritime influence will also bring stormy phases, mostly in fall and winter though. During some summer days, you will be reimbursed with around 10 hours of sunshine at the river Elbe and a view of the clear blue sky. Some original dishes of Hamburg include Birnen, Bohnen und Speck (green beans cooked with pears and bacon), as well as Aalsuppe, literally meaning eel soup, but does not necessarily include eel. It is a soup made of all different kinds of things but today eel is often included to meet customers expectations. Also what is internationally known as american hamburger might have developed from a dish from Hamburg called Frikadeller, which is a larger, pan-fried patty which is usually served with potatoes and vegetables instead of a bun. Also on offer at any streetfood market: craft beer from local microbreweries. Only two years ago, the choice of beer in Hamburg’s pubs and clubs was largely confined to appealing lager varieties from a limited number of national breweries. However, a lively craft beer scene has evolved in Hamburg in recent years.